Anyone who owns a USB could only wish for two things – that their device easily protects files and that it doesn’t get stolen. For one thing, you store your most important information on your USB stick. But what if someone asks to borrow it? Worse, what if someone steals it? You do not want that data in another person’s hands. A great option would be a USB stick that would allow you to keep your data to yourself but would still be easy for you to access. 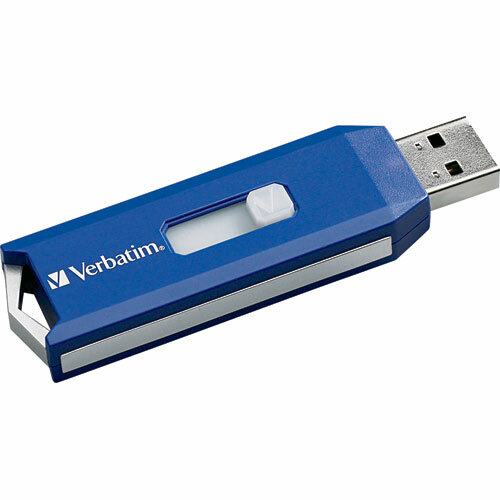 The Verbatim Store ‘n’ Go Pro USB satisfies your needs as it allows for easy-to-use encryption so you can separate your private data from what is available for public viewing. After recently coming up with the colorful Store ‘n’ Go V3 USB sticks, Verbatim, a world leader in manufacturing CDs and Blu-ray discs, ups it a notch with the launching of the new Store ‘n’ Go Pro USB 3.0. Just by looking at it, the Store ‘n’ Go Pro USB looks more formal than its predecessor, with its lightweight smooth blue plastic case. The plastic cover protects the metal inside, which peeks from the sides of the drive, and can easily be retracted when not in use. There’s also a loop for a lanyard at the other end of the drive so the USB flash drive can be carried anywhere, anytime. The best feature of the Verbatim Pro is its ability to store data and keep it private. The 256-bit AES hardware data encryption makes this possible, and with the help of the V-Safe Security software, setting up a password to lock your privacy zone is as easy as 1-2-3. This feature makes it possible for the user to hide private items while allowing others to view the rest of the files. Whether you’re using a Windows (7, Vista and XP), Mac (OS 9.0 and up), or Linux (Kernal Version 2.6.x and up), you can use the Verbatim Pro USB 3.0 conveniently. However, the USB 3.0 doesn’t run as fast as we’d expected it, with read speeds up to only 30 MBps and write speeds up to only 12 MBps. For the price (the 64-GB Pro USB 3.0 is sold at $117), you could get other brands cheaper. However, if you’re looking for security that’s easy to use, then the Verbatim Pro USB 3.0 is just what you’re looking for. This entry was posted in Articles, USB 3.0, USB 3.0 Flash Drives, USB Flash Drives, Verbatim, Verbatim Store n Go and tagged colorful Store n Go V3 USB sticks, USB Flash Drive, USB Sticks, Verbatim Pro, Verbatim Pro USB 3.0, Verbatim Store N Go Pro USB. Bookmark the permalink.